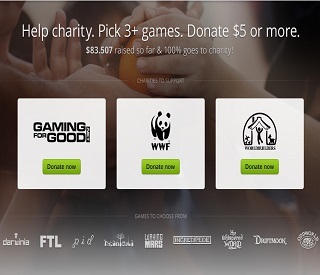 GOG's "Pick 3+, Donate $5" promo brought in $1.9 million in donations during its November 2013 run. You may recall back in November 2013 that GOG hosted a special "Pick 3+ Donate $5" promotion that offered customers a chance to choose three games from a list of participating developers in exchange for a small donation to a selected charity. Hoping to help maximize the total donations, the company took the step of putting up its own money to cover cash drains like credit card fees and other expenses. Now, several months later, GOG has revealed the end results of the Pick 3 charity drive. The retailer took in a substantial $1.9 million in donations during the week long run of the Pick 3 promo. The funds, in turn, were distributed to the World Wildlife Federation, Worldbuolders and Gaming for Good to aid in their efforts. GOG attributes the success of the charity drive to its customers and to the participating developers who agreed to give up their regular royalties for the duration of the promo. "The combination of these selfless developers and GOG.com's great gaming community--and the fact that they were willing to support these great causes--were the real cause of the success of the fundraiser, and continue to show that gamers around the world love to help make the world a better place," said the company in a statement. Not that GOG made the donations all that painful. While we would never think of diminishing the generosity exhibited by gamers during the course of this and other charity drives, it probably did help that a $5 donation earned you your choice of some great games. Heck, we'd be happy just to get FTL (one of the included titles) for that much on its own. Regardless of what drove the donations, $1.9 million in funds for charity is an undeniably good thing and we hope GOG and other online retailers will try similar promotions in the future.